Daughter of Poti-pherah, priest of On, and wife of Joseph (Gen. xli. 45). The name is apparently Egyptian; but no satisfactory explanation has yet been proposed. That Joseph, called "the righteous" (Book of Wisdom x. 13; Ab. R. N. xvi., and elsewhere), should have married a heathen wife seemed objectionable to the Rabbis; and they consequently state that she was the child of Dinah, the daughter of Jacob, born after violence had been done her by Shechem, the son of Hamor (Pirḳe R. El. xxxviii. ; Midr. Abkir, quoted in Yalḳ., Gen. 146; Targ. Yer. Gen. xli. 45, xlvi. 20; Midr. Aggadah, ed. Buber, i. 97). When her brothers had learned of the birth of an illegitimate child in their family, they wanted to kill the child in order to prevent public disgrace. But Jacob placed upon the child's neck a talismanic plate engraved with the name of God, and—according to one version—left her exposed under a thorn-bush ( , "seneh," whence the name of the girl, "Asenath"), and the angel Gabriel carried her to the house of Potiphar in Egypt, where the latter's wife, being childless, reared her as her own daughter. According to another version (Midr. Aggadah, l.c. ), Jacob had the child exposed under the walls of Egypt. Her crying attracted the attention of Potiphar, who was passing at the time. 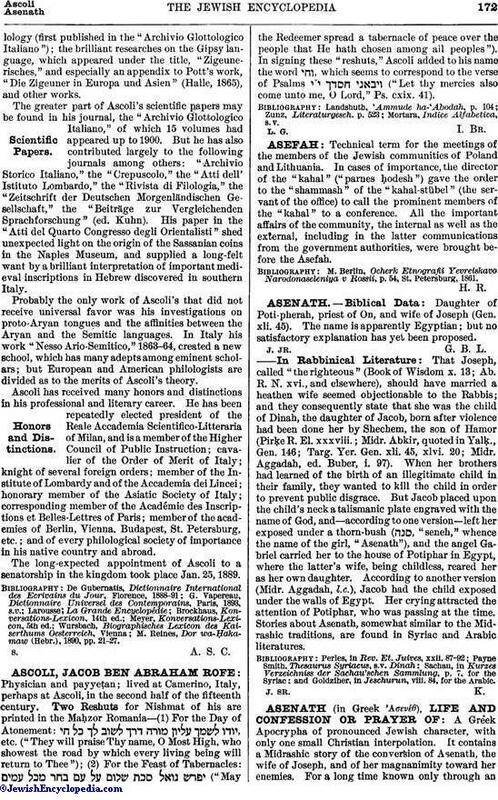 Stories about Asenath, somewhat similar to the Midrashic traditions, are found in Syriac and Arabic literatures. Goldziher, in Jeschurun, viii. 84, for the Arabic.